Every shop and garage needs a good workbench for DIY projects. A minimal workbench is all some shop owners require, while others believe the best workbench is one with a few frills. Our top picks illustrate three distinct types of workbenches for your consideration and we threw in some suggestions for turning your workbench into a DIY project in itself. For many, the best workbench for the money is actually a custom do-it-yourself setup to fit the area it’ll be in as well as the types of uses you’ll have for it. That said, you can’t go wrong with any of the options below and the convenience factor they offer. If you want a deluxe workbench straight out of the box, an excellent choice is Seville’s UltraHD Workbench. Headquartered in the USA, Seville Classics Inc. specializes in home organization products, and their lighted UltraHD workbench is no exception. It has a sturdy steel frame and 1-½ inch thick beech wood top, built to stand up to any project you are ready to undertake. The double drawers are cushioned to prevent scratching, and the unit comes with cantilevered shelves to give you even more storage space. If you like to keep your tools close at hand, you will appreciate the pegboard back and 23 piece hook set. And not only does the fluorescent light give you plenty of visibility, it also includes a power strip for convenience. With a total height of 64 inches, this workbench will need to have plenty of space to fit into the garage. The good news is that it only weighs 69 pounds, so you will able to move it around a little while getting it into place. It might also be a good idea to add a shield around the light fixture, both to protect the light and to shield your eyes from direct exposure. 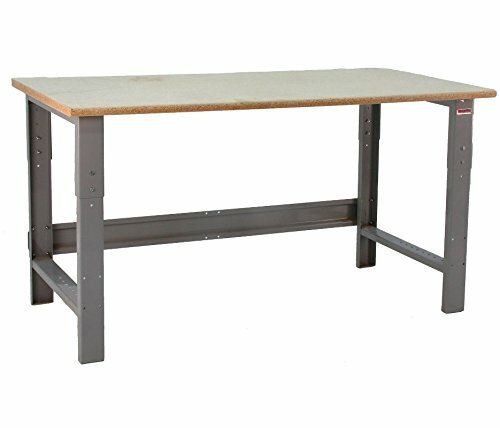 If you’re looking for a good, basic, heavy-duty workbench, this 6-foot long bench is built to support up to 3,000 lbs. The legs are adjustable from 28-42 inches in 1-inch increments so you can set it to the perfect height for your use, whether you’re working from a seated or standing position. At full height, you can pair it with a matching Husky base cabinet which fits perfectly underneath or any other cabinet under 37″. The solid wood top is 1.25″ thick and feels similar to a butcher block counter. It’s a good solid surface to mount your bench vise. Weighing a bit over 100 pounds, this workbench is heavy. So while it make take a bit more effort to move around, you’ll always have a solid base to work on. The adjustable legs are a big selling point and gives this bench its versatility. While it’s made for a garage, it may just as well be a great craft table or sit/stand desk for the office. 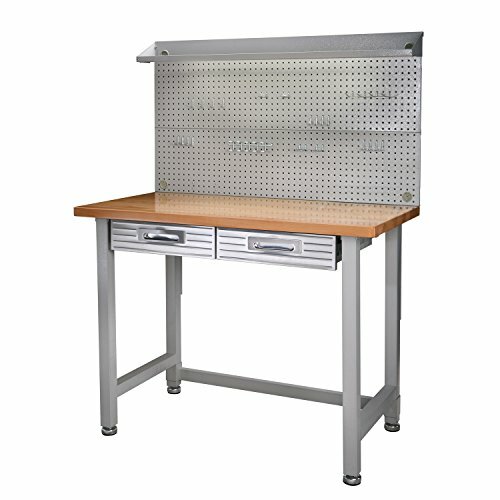 American owned BenchPro has filled contracts for NASA, the US Army, and more, earning a great reputation for table and bench construction, and this steel frame workbench with an extra thick particle board top is noted for ease of access. It features a simple tabletop design that is capable of supporting up to 1600 pounds, and the height can be adjusted from 30 to 36 inches. The table dimensions are fairly standard for a workbench, at 48 inches by 24, but the open top design means you can have all the room your shop has to spare on larger jobs. If you are looking for special features, this wouldn’t be the best workbench for you, but it works perfectly as a shop table for projects that require 360 degree access. Unfortunately, the particle board top is not a finished surface, so you will need to seal it if you want to continue using it for years. On the other hand, the top is easily replaceable, so you could even decide to move up to a hardwood top if for instance you want a more stable surface to install a bench vise on. Designed to support up to 1000 pounds, the American-made Hopkins 2×4 Basics is an alternative way to build a great workbench to your specs. 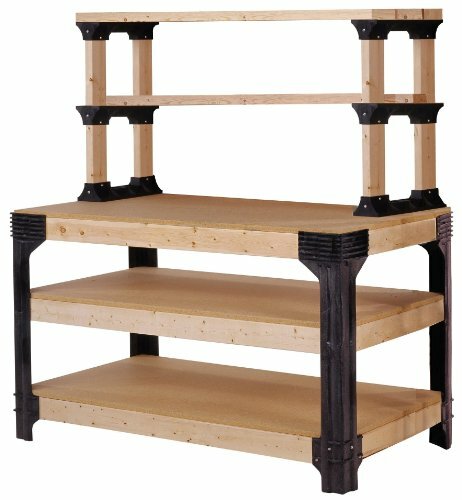 Instead of providing you with the table and shelf surfaces, the system provides you with supports and a shelf building system that you provide your own lumber for. That means you can have a workbench up to 8 feet long and 4 feet wide if you needed it. Keep in mind that the Hopkins kit does not include the plywood and 2×4 boards, and that you will have to make a few 90 degree cuts using your table saw and/or miter saw when building it. Or have your local big box home improvement store cut the pieces for you. The patented ShelfLinks accessories will allow you to create a custom workspace that includes top or side shelves, cut to fit exactly where you want it. Another option is put those woodworking tools to good use and build your own custom workbench. There are dozens of free plans available online for building a workbench to meet any special needs, including plans for a collapsible workbench that hides away when you are not using it. The benefit of building the best workbench for yourself is that you can create exactly what you want, including shelves, drawers, a custom width and length, and more. You could for instance build it to a size which fits perfectly inside that new outdoor shed you just bought or even so it’s flush with the top of the tool cabinet in your garage. On the other hand, building completely from scratch might cost more than purchasing a fabricated workbench, not to mention that the ability to read or draw your own plans is imperative. In the end, the DIY workbench is going to be a little more costly and a lot more work, but it will be a unique creation that conforms to your tastes and work habits in a way that no standard workbench would ever do.